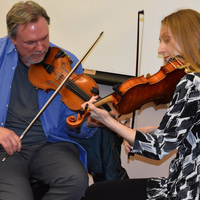 This is an incredible opportunity to receive official training and certification in the O'Connor Method for violin and strings directly from Mark and Maggie O'Connor. Mark O'Connor is a multi Grammy winner, an invested pedagogue and a champion of alternative styles in string performance. His method is in line with NAFME's new national and state standards emphasizing creativity and improvisation. Register online for a 2-day seminar, December 8-9, 10 am - 4:30 pm. This is the only training session available in California.